What opportunities could there be for the UK digital sphere as we transit to Brexit? Can the UK act more nimbly than the 27 in evolving its rules better to suit the fast moving digital space as we fork from the EU legislative body? In transition what non-regulatory opportunities might arise? What could we do better in the digital sphere if we can move quicker and steal competitive advantage? How could Britain become a better (digital) society if we can move independently and swiftly outside the EU system? What opportunities are there to amend legislation in the short term as it is read into UK law? What lessons can be learned from elsewhere? Come along and discuss this with a small group on Tuesday 8 November at 19:00 in the Impact Hub Kings Cross. Positive potential for the UK digital sphere in Brexit has not yet been fully drawn out – if you have seen a piece doing this please add a link in the comments. I am starting a short piece of research for Carnegie UK Trust to look at Brexit digital issues. My initial focus will be opportunities that may arise from Brexit, my work will take an optimistic, progressive approach at a time when public policy is open to new ideas and make new suggestions. I shall slip back into my professional intellectual neutrality from 15 years as a civil servant serving Conservatives and Labour, putting aside my remain campaigning (as indeed have many politicians). This research will take place against a fast moving background and may become out of date almost as soon as it is published. The research might not yield any positive results of course. Some headline observations and questions follow as they seem to me at the outset of my work, some sections are of course more worked up than others. What follows are my views, not Carnegie’s. Impact on ‘factors of production’ is a useful strategic lens for economy-scale change. Land, labour and capital are traditionally regarded by micro economists as the primary ‘factors of production’ that underpin production of goods and services. ‘ Entrepreneurship’, as a broad willingness in society to transform these factors into products is often added in as a fourth factor. For the digital sphere we can almost substitute ‘intellectual property’ for land. The government plans explicitly to restrain the movement of labour. For the tech sector this risks reducing the supply of labour. So at a strategic level the primary focus for government and industry should be on post Brexit labour supply both to increase the domestic supply of labour and impact mitigation for specialist labour flows from overseas. We can already see signs of this in policy announcements by DCMS Secretary of State, Minister for Skills and the Minister of State responsible for digital policy. Digital industry, in a Tech City survey of 1,200 people in July reports labour issues as their highest priority. The Prime Minister hasn’t given an official report of her trip to India but seems to signal that one fast track business executive visa service ‘The Great Club‘ will be expanded as well as possible changes to the wider India/UK visa system if returns are improved. The uncertainty during the transition to Brexit could impact entrepreneurship, that could be offset by government stimulus and incentives. This should be the biggest chance for a generation for the tech sector to improve the government’s migration schemes. Can the UK tech industry channel its energy into designing a better, quicker visa system for people with necessary skills? Will the Home Office come to the table for a user-led design process? What can be learned from other countries’ high-skill visa programme? How can the UK have the world’s best high level digital skills migration scheme? How can the tech sector fight to ensure that, within any future quota systems its needs are met? Better visas, not necessarily more in total. The government has signalled with the ‘Nissan deal’ that it is open to special pleading – is labour the area tech should seek its deal with the government? Wider Brexit issues will affect capital and IP flows, but the government does not set out explicitly to constrain those. Indeed the government broadly plans to encourage greater mobility in the latter two through the medium of ‘free trade’. It isn’t yet evidenced how the government’s plans for Brexit will affect net capital flows/funding availability in the medium term, despite much speculation. I should be interested in countervailing arguments to this general view. I shall be looking in detail behind the media reports at various government reassurances on sustaining EU funding to industry. ‘UK patent and trade mark attorneys continue to have all the rights they have at the moment to work before the UK and European IP Offices. CIPA will work with the UK Government and other interested parties to ensure that as many of these rights as possible are retained after exit from the EU. Does greater independence for UK regulation give more scope for balancing the rights of free speech with protection of citizens from harm caused by offensive speech? EU telecommunications law was heavily influenced by the UK in the 1990s when it was formed, then adopted in the UK. Can any additions or subtractions be made to this to allow markets to function better in the UK for the consumer and investor? The Chief Executive of OFCOM has written a general article on telecoms and broadcasting. Is the government taking part in ‘regime shopping’ in general practical or desirable? Would the UK be better placed to retain the regulatory certainty of the existing regimes that work well at a time of increased business uncertainty? How big would regulatory benefits be to make it worth changing a regime? After some initial caution, the Secretary of State for Culture Media and Sport has signalled that the UK will adopt the GDPR in 2018 in her 24 October appearance before the Select Committee. Karen Bradley’s statement appears worded so as not to be conclusive on a post Brexit regime – she is providing certainty for businesses to plan for a major change in 18 months. The ICO has written about the GDPR and Brexit and how to prepare. Given the room for manoeuvre in the Secretary of State’s words, it isn’t clear if a debate is going on about whether the UK should we simply adopt the GDPR as is or is there a different form of data protection such as Privacy Shield that would eventually allow British data services to trade in the EU (i.e. is reciprocal)? Is there a better response to Podesta’s challenge for trading blocs to engage with the USA on data and tech issues? What could be done to improve citizens data rights AND make UK industry more competitive through smarter regulation? Given the uncertainty a new regime would cause, how great an advantage would such a regime have to deliver to make it worthwhile? The terms on which UK businesses will have ‘access to’ the single market are critical, but will take several years to resolve and we don’t know yet what the Government’s negotiating ‘hand’ is. The Commission has published a broad package of proposals for a digital single market (including recently on telecoms) but it isn’t clear yet when this will come into force, nor if the EU system can reach agreements on all its aspects. Is the digital single market more incremental and repackaging than revolutionary? What critical infrastructure for UK digital products and services is physically in the EU27? What cloud services and advanced internet services for instance would we need to have in the UK to enable our tech companies to develop and deliver services here when outside the EU. For instance, if I am used to running or developing my software in the cloud which happens to be in Germany or just running a small business website how does that work post Brexit? Is there an opportunity to develop such services in the UK? 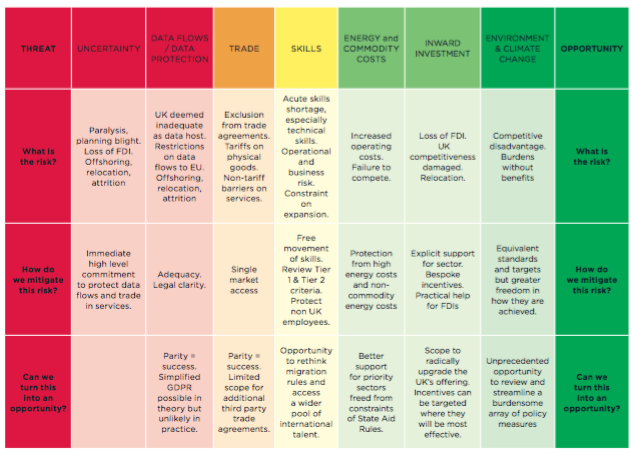 The UK Council of Data Centre Operators and Tech UK have produced a report on opportunities and risks of Brexit with a graphic at the top of this blog post. Does Brexit provide opportunities for improving poor rural broadband and mobile coverage with more bespoke, nimble interventions then the State Aid rules allow? Are there similar opportunities for more direct fibre to the premises and future networks in a Brexit environment with simpler State Aid-type rules in a WTO setting? Brexit gives an opportunity to test whether the UK’s procurement rules are in fact the product of the EU system or a broken domestic approach to procurement. Certainly when I worked in central government tech procurement felt like bureaucratic self harm. What does this mean for digital companies and people who might benefit from services so procured in local and central government? The UK Spectrum Policy Forum has produced a helpful report to DCMS on the implications of Brexit for spectrum. Comments are moderated – on topic, courteous, evidence based comments welcome – think more FT comments than The Sun. The bulk of my professional career has involved giving advice from a neutral perspective in the civil service independent of my personal views, I served both Labour and Conservative administrations, winning praise from people as diverse as Robin Cook, Michael Heseltine, John Battle, John Prescott and Tony Blair. I shall conduct this research in a neutral manner. When I joined the Civil Service in 1993 I entered the European Fast Stream, designed to send me to Brussels as a Brit. I left that stream after two years as I found Brussels unpalatable – too detached from the visceral reality of people’s lives, as the referendum has demonstrated. I went on though to take part in and chair many international governmental fora in the OECD, EU and security circles. I am pro-remain and donated to one of the remain campaign groups (We Are Europe) as they have declared to the Electoral Commission.